What makes a dance performance "traditional," "cultural" or "ethnic"? What if that dance or dance style is so deeply intertwined within a family or community's life, they don't see it as a "dance," a "dance form" or even as "art"? Vail Dance Festival's 2018 season begins this month, and the program is designed to give dancers and musicians the opportunity to experiment in new forms and with new partners. "For the 30th-anniversary season, there is a special obligation to present the essence of who we are as a festival," director Damian Woetzel says. "In that spirit, we have even more new work being developed, even more collaboration and even more new companies taking the stages in our communities." The inaugural season of the New Movement Residency at USC Glorya Kaufman School of Dance launches this month, giving three choreographers—Ana Maria Alvarez, Seda Aybay and Loni Landon—a space to explore, create and prepare works for touring and presentations. When students go through puberty, the body they've been diligently training may suddenly change. Growth spurts can throw off balance and reduce flexibility, a combination that can increase the risk of injury. You can help your students hold on to their technique and confidence during this transition, as well as teach them how to use their changing bodies safely and effectively. He might have just had a long day of rehearsals prepping for a performance at the Paris Internationale art fair, yet Dimitri Chamblas is energized as he talks about his new role. The 42-year-old took over this year as dean of The Sharon Disney Lund School of Dance at the California Institute of the Arts (CalArts), and his enthusiasm for the future of dance and dance education is contagious. "We want to keep recruiting diversity of techniques and bodies, because the future of dance is that," says the former artistic director of Paris Opéra's creative digital platform 3e Scène. "We want students who have temporality, space, precision—where you can consider your body as a space for exploration—and we want to help them develop their singularity and creativity." As an artist, Chamblas connects dance to the visual arts, filmmaking, new media, digital production and architecture. His past collaborative partners have included Benjamin Millepied, RubberLegz, William Forsythe and Lil Buck. "We have to concentrate on how to prepare students for the actuality of a dance career," Chamblas says. A dance career no longer means joining a company until retirement, so he wants his students to learn how to perform or choreograph for nontraditional spaces, social media, films, photography and commercials. Classwork will include guidance on writing business plans, photography/videography tips (in front of and behind the lens) and advice on creating a dance company. Chamblas' international dance connections will help land guest artists, and he envisions the school being more integrated into the Los Angeles dance scene. He also plans on starting a CalArts dance company with its own repertoire. "Dimitri brings a fresh point of view and vision for the dance program," associate dean of dance Cynthia Young says. "His energy is inspiring and unrelenting." 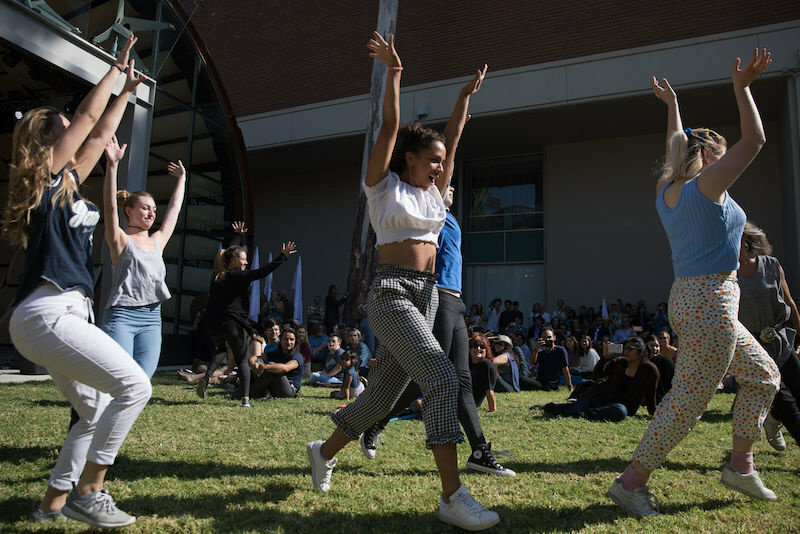 CalArts president Ravi S. Rajan says that in Chamblas' short tenure, he has already motivated students with such projects as a flash mob during the school president's inauguration ceremony. "This work directly demonstrated the relevance of dance to our lives," Rajan says. Keeping one boy engaged among a lot of girls can sometimes be a challenge. Here are some tips from Sue Sampson-Dalena, owner of The Dance Studio of Fresno, to keep the boys' attention in check. Anne Kramer, owner/artistic director of Dance Etc. in Milford, Ohio, with her students. Photo by Jorja Vornhder, courtesy of Kramer. While regular technique class is the backbone of a young dancer's training, it's also important for all of your dancers—from the tiniest to the most accomplished—to experience creative movement, improvisation and dance making. “Even at age 5 or 6, if the child makes up her own dance, I see a better performance," says Ellen Robbins, a New York City modern teacher and director of Dances by Very Young Choreographers. Choreographing helps students think more creatively about every aspect of dance, and it gives them a sense of pride and accomplishment. Several veteran teachers who work specifically to develop choreographic skills in students share with DT their tips for guiding the dance making process.